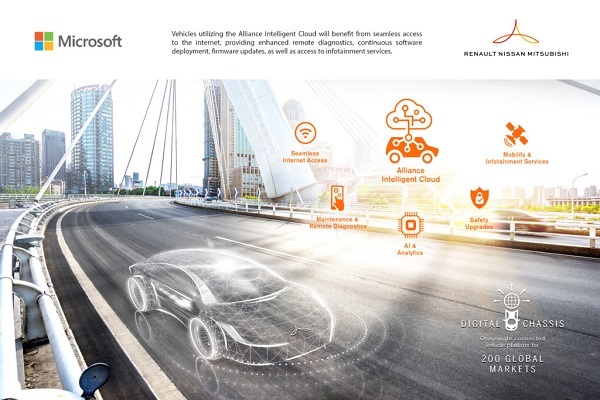 Renault-Nissan-Mitsubishi automotive alliance has announced the production release of the Alliance Intelligent Cloud, a new platform. The platform will enable Renault, Nissan and Mitsubishi Motors to deliver connected services in vehicles sold in nearly all 200 markets served by the Alliance member companies. Culminating joint development efforts between the Alliance and Microsoft, connected vehicle program will be deployed utilizing cloud, artificial intelligence (AI) and IoT technologies provided by Microsoft Azure. According to the company, the Alliance Intelligent Cloud is a highly-scalable platform and will consolidate multiple legacy connected vehicle solutions with current and future connected car features and business operations that will support mobility services. The data-driven platform will enable advanced AI and analytics scenarios and accelerate time to market for new innovations and business initiatives.